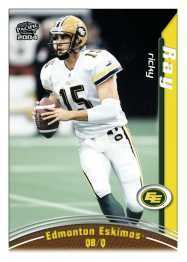 Pacific Trading Cards will be present at two fanfest events in Canada this weekend to promote trading cards and collectibles. Saturday, Pacific will be present in conjunction with the CFLPA at the Calgary Stampeders Fanfest at McMahon Stadium. 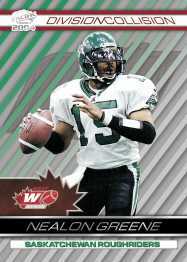 The CFLPA will be unveiling Pacific's new 2004 CFL trading card designs to fans in Calgary, and Todd McFarlane will be the Stampeders special guest. McFarlane designed the new CFLPA logo, which will also be unveiled at the event. Sunday, Pacific will be at the B.C. Lions fanfest at B.C. Place Stadium in Vancouver. Both events will feature interactive activities for fans, as well as several players from both teams being available for autographs. Pacific CFL and Atomic products from last season will also be available. "These events are a great way to introduce CFL football card collecting to the fans throughout Canada," said Jeffrey Morris, Pacific's VP of Marketing. "The teams, the league and the players association have been great to work with as we try to build this market and hobby up from grass roots levels. In Calgary, the excitement of the Flames' playoff success will have a positive impact on the Stampeders' event, plus having Todd McFarlane there will make it a great opportunity for all sports fans." 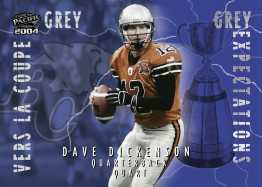 Pacific's 2004 CFL Football product will go on sale in mid-June, during opening week of the CFL season. 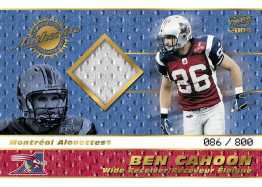 There will be two authentic game-used jersey cards per box, as well as randomly inserted autographed cards. Packs will have a suggested retail price of $3.99 Canadian ($2.99 USD).